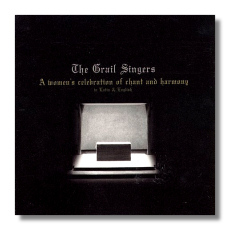 The Grail Singers are an off-shoot of the American Grail, "an ecumenical organization of women who focus on such concerns as spirituality, ecology, feminism, the arts and social justice" – so the notes tell us. They also go on to say that "this collection (is) more spirited than the more familiar men's chant." That, of course, is an opinion, and a rather daring one at that, inasmuch as there is a veritable plethora of "men's" chant CDs on the market – a plethora hardly any one individual could know well enough to make sweeping statements about. Moreover, I'm not sure there is a men's style of chant performance, as opposed to a women's. In any event the performances here are generally quite good. I especially like Sarah Maria Dorff, Cantor in the opening selection, Ave Maris Stella. I'm also impressed by the trio, Margaret BISel, Barbara Gibbons, and Kay Jacob, in Ad Te Levavi. These four appear in different combinations in many selections and always acquit themselves nicely. The work by the entire group of eighteen singers (generally divided into groupings of soprano, second soprano, alto, Schola, and Schola Minor) is generally quite compelling – and, I can't deny, spirited throughout. Many of the selections here are not traditional chant, or hymns derived from the Mass or Vespers. Behold the Lord Comes is a collective creation by The Grail, in an arrangement by Conductor Malley. It's an effective piece, with unison singing at the outset that divides into two in places to yield Romantic-era harmonies. Lynn Malley's own Giver of Life and Song of the New Covenant (inspired by Panis Quem Ego, also included on the disc) are both ingratiating creations. In all, there twenty-eight tracks, and much variety. Full texts are provided, though the notes are skimpy. The only negative aspect here is the shrill acoustical surroundings. The notes tell us the recording venue was the Grail's center of worship – "a converted vintage barn." Upper notes sound murky and a bit harsh. Still, the overall effort must be counted as a success. 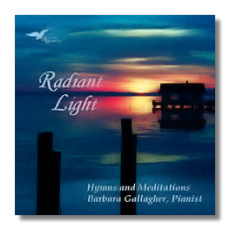 In the second CD issue listed in the headnote, pianist Barbara Gallagher plays mostly light religious fare with commitment and panache. To be sure, this piano music isn't the least like the more sacral, meditative and virtuosic outpourings that Franz Liszt composed in this vein, nor does it sound somber and pristinely threadbare like the many chant discs overpopulating the record bins today. Rather, it is decidedly upbeat music, featuring hymns like Adoro Te Devote and Radiant Light, spirituals like Balm in Gilead/Kum Ba Yah and Lord I Want To Be a Christian, rendered in a sort of innocuous modern-inspirational style that is quite common today. Gallagher, herself a composer (Serenity and Once in a Garden, performed here are her own compositions), did the arrangements. She has impressive compositional credentials, having studied with Persichetti, though you'd never guess it from her mellow style, as evidenced here. If I hear an influence in her work, in fact, it might be that of Dave Grusin. Be Thou My Vision, from an Irish ballad, may be the straightest and most effective transcription on the disc, not least because of the touching melody and simple rendition. Radiant Light and Adoro Te Devote are also quite good, and at times nearly escape that modern-inspirational mold. I don't frankly care for the fade-out endings in Balm in Gilead, Lord I Want To Be a Christian and How Can I Keep from Singing. I suspect a producer or someone on the production end of things may have had a hand in using this unfortunate practice. There are fourteen selections in all, and to those seeking a soothing, pleasant disc of religious music, this may be of interest. The sound is good, but the notes are skimpy.